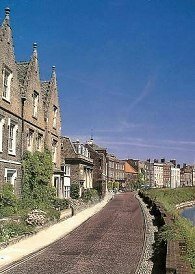 Anglia is located in the attractive market town of Wisbech, Cambridgeshire. Owing its distinctive character to the 17th and 18th centuries, Wisbech is home to some fine architecture such as Peckover House with its outstanding Victorian gardens as well as an outstanding Georgian crescent in the gardened area around the castle. View of the North Brink, Wisbech. Standing on the banks of the river Nene, the 'North Brink', shown on the left, is widely acknowledged as the best example of a Georgian Street in the country - it may be more familiar than you think - it was used as the location for the BBC's costume dramas 'Martin Chuzzlewitt' and 'David Copperfield'. With these pleasant surroundings, quiet roads and the Norfolk coast and countryside on your doorstep, you might expect house prices to be prohibitively expensive. You couldn't be further from the truth - in fact they are some of the lowest in the country. This is one of the reasons why a career relocation to Anglia is such an attractive proposition, and you will be working for a vibrant and dynamic company. Check out our Career Opportunities section for details of the current positions available. Click on this link or the graphic to the right to view a map showing how to get to Wisbech (Adobe Acrobat .pdf format).